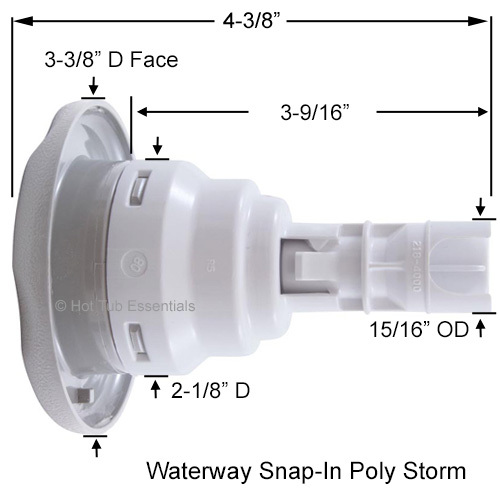 Waterway Massage Poly Storm Jet Insert (includes diffuser). 3-3/8" Face Diameter Poly Storm Jets are interchangeable with 4" Large Face Diameter Mini Storm Jets. If you have Snap-in style jet housings, you must use Snap-in style inserts (the newer threaded style inserts will not fit).To install jet insert, push in and rotate a 1/4 turn clockwise. To remove jet, rotate counter-clockwise (about 1/4 turn until it stops) then apply additional turning force to unlock. Once these are gone, There will be one replacement option - 212- 8059-STS Light Grey "Sterling Silver" – Directional Jet.